The full strategic plan document is provided here. The following text has been extracted from the document's Executive Summary. The Office of the Assistant Secretary for Research and Technology (OST-R) led the preparation of the RD&T Strategic Plan, relying heavily on input from the Department's Operating Administrations. The Strategic Plan also includes feedback from external stakeholders through a period of public comment in the spring of 2016 and a two-day workshop with transportation experts representing the various sectors and disciplines in the transportation research enterprise. Input from all of these sources has been incorporated into the development of this strategic plan. Promoting Safety relates to safety issues affecting all modes and the development and deployment of countermeasures designed to address these issues. U.S. DOT's goal is to improve public health and safety by reducing transportation-related fatalities and injuries. Improving Mobility refers to demographic, economic, geographic, cultural, and technological trends affecting travel demand, personal and commercial mobility across all transportation modes, and the effects of those trends on quality of life and access to economic and educational opportunities. U.S. DOT's goal is to improve the mobility of people and goods, reduce congestion, and increase access to opportunities for all. Improving Infrastructure covers issues relating to the condition, costs, funding, and delivery of the transportation infrastructure, as well as the methods and technologies to increase its durability and resilience. U.S. DOT's goal is to improve the durability and extend the life of the transportation infrastructure, preserve the existing transportation system, and ensure that the U.S. proactively maintains the critical transportation infrastructure in a state of good repair. Preserving the Environment covers the effects of transportation activities on climate change and the environment as a whole (including water, noise, and air pollution, and habitat degradation) and discusses approaches to avoid or mitigate those effects. U.S.DOT's goal is to advance environmentally sustainable policies and investments that reduce carbon and other harmful emissions from transportation sources. The Strategic Plan describes the current and planned Research and Development (R&D) strategies used by the U.S. DOT Operating Administrations to address the research needs within each critical transportation topic area. Cross-modal research areas and collaborative initiatives are also highlighted. The Strategic Plan also describes four overarching research themes identified during the stakeholder engagement process that cut across all of the critical transportation topic areas. These are Policy Research, Emerging Technology, Strengthening Research Coordination, and Big Data. The Strategic Plan strongly emphasizes U.S. DOT efforts to promote the deployment and adoption of research results by integrating technology transfer throughout the research and development process. 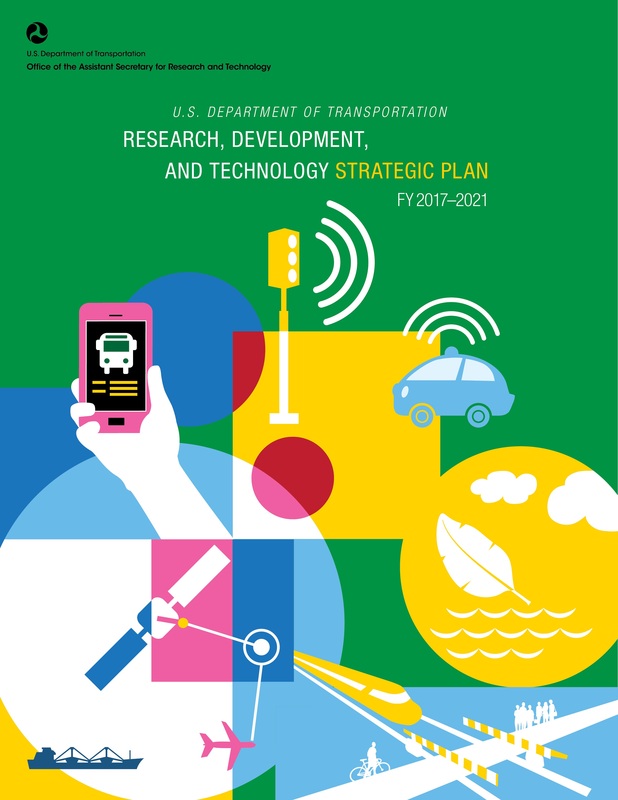 It describes how the Department's Technology Transfer Program and each Operating Administration's Technology Deployment strategies address the FAST Act requirement to specify how research findings will be used to improve the efficiency, effectiveness, and safety of transportation systems. Implementation of the Strategic Plan will take place on two levels. First, there are a range of FAST Act requirements that dictate how the Strategic Plan will be used to guide and report the Department's RD&T activities over the next five years, including the submission of Annual Modal Research Plans by each Operating Administration for review by OST-R. Second, each Operating Administration is responsible for tracking and evaluating the performance of their RD&T strategies. These processes are described in the final chapter of this Strategic Plan. As mandated in the FAST Act, the Strategic Plan also includes program-level information about expected Department research findings by the end of FY2021, and the annual funding levels anticipated by each Operating Administration during the period covered by the Strategic Plan (FY2017-21). This information is provided in Appendices A and B.